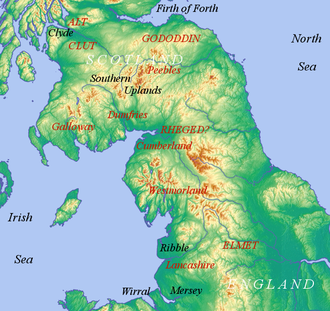 Cumbric was a variety of the Common Brittonic language spoken during the Early Middle Ages in the Hen Ogledd or "Old North" in what is now Northern England and southern Lowland Scotland. It was closely related to Old Welsh and the other Brittonic languages. Place name evidence suggests Cumbric may also have been spoken as far south as Pendle and the Yorkshire Dales. The prevailing view is that it became extinct in the 12th century, after the incorporation of the semi-independent Kingdom of Strathclyde into the Kingdom of Scotland. Dauvit Broun sets out the problems with the various terms used to describe the Cumbric language and its speakers. The people seem to have called themselves *Cumbri the same way that the Welsh call themselves Cymry (most likely from Brittonic *kom-brogī meaning "fellow countrymen"). The Welsh and the Cumbric-speaking people of what are now southern Scotland and northern England likely felt they were actually one ethnic group. Old Irish speakers called them "Britons", Bretnach, or Bretain. The Norse called them Brettar. In Medieval Latin, the English term Wales and the term Cumbri were Latinised respectively as Wallenses "of Wales" and Cumbrenses "of Cumbria". The usual English usage was to call them Welsh. In Scots, a Cumbric speaker seems to have been called Wallace, from the Scots Wallis/Wellis "Welsh". In Cumbria itaque: regione quadam inter Angliam et Scotiam sita – "Cumbria: a region situated between England and Scotland". When King Rederech (Rhydderch Hael) and his people had heard that Kentigern had arrived from Wallia [i.e. Wales] into Cambria [i.e. Cumbria], from exile into his own country, with great joy and peace both king and people went out to meet him. John T. Koch defines the specifically Cumbric region as "the area approximately between the line of the River Mersey and the Forth-Clyde Isthmus", but goes on to include evidence from the Wirral Peninsula in his discussion and does not define its easterly extent. Kenneth Jackson describes Cumbric as "the Brittonic dialect of Cumberland, Westmorland, northern Lancashire, and south-west Scotland..." and goes on to define the region further as being bound in the north by the Firth of Clyde, in the south by the River Ribble and in the east by the Southern Scottish Uplands and the Pennine Ridge. The evidence from Cumbric comes almost entirely through secondary sources, since no contemporary written records of the language are known. The majority of evidence comes from place names of the extreme northwest of England and the south of Scotland. Other sources include the personal names of Strathclyde Britons in Scottish, Irish, and Anglo-Saxon sources, and a few Cumbric words surviving into the High Middle Ages in southwest Scotland as legal terms. Although the language is long extinct, traces of its vocabulary arguably have persisted into the modern era in the form of "counting scores" and in a handful of dialectal words. From this scanty evidence, little can be deduced about the singular characteristics of Cumbric, not even the name by which its speakers referred to it. What is generally agreed upon by linguists is that Cumbric was a Western Brittonic language closely related to Welsh and, more distantly, to Cornish and Breton. Around the time of the battle described in the poem Y Gododdin, Common Brittonic was believed to be transitioning into its daughter languages: Cumbric in North Britain, Old Welsh in Wales, and Southwestern Brittonic, the ancestor of Cornish and Breton. Kenneth Jackson concludes that the majority of changes that transformed British into Primitive Welsh belong to the period from the middle of the fifth to the end of the sixth century. This involved syncope and the loss of final syllables. If the poem dates to this time, it would have been written in an early form of Cumbric, the usual name for the Brythonic speech of the Hen Ogledd. Jackson suggested the name "Primitive Cumbric" for the dialect spoken at the time. Cumbric place names are found in Scotland south of the firths of Forth and Clyde. Brittonic names north of this line are Pictish. They are also found commonly in the historic county of Cumberland and bordering areas of Northumberland. They are less common in Westmorland, with some in Lancashire and the adjoining areas of North Yorkshire. Approaching Cheshire, late Brittonic placenames are probably better described as being Welsh rather than Cumbric. As noted below, however, any clear distinction between Cumbric and Welsh is difficult to prove. For references see Armstrong et al., Watson and Jackson. Many Brittonic place-names remain in northern England, which should not be described as Cumbric because they originated from a period before Brittonic split into its daughter dialects e.g. Welsh, Cornish, Breton and – arguably – Cumbric. Bathgate, West Lothian. Meaning 'boar wood' (Welsh baedd "wild boar" + coed "forest, wood"). Carlisle, Cumbria. recorded as Luguvalium in the Roman period; the word caer "fort" was added later. The Welsh form Caerliwelydd is derived by regular sound changes from the Romano-British name. Glasgow, Scotland. Widely believed to derive from words equivalent to Welsh glas gau "green hollow" (possibly that below Glasgow Cathedral). Lanark, Lanarkshire. From the equivalent of Welsh llannerch "glade, clearing". Penicuik, Midlothian. From words meaning "hill of the cuckoo" (W. pen y gog). Penrith, Cumbria. Meaning "chief ford" (Welsh pen "head; chief" + rhyd "ford"). Some Cumbric names have historically been replaced by Gaelic or English equivalents and in some cases the different forms occur in the historical record. Edinburgh occurs in early Welsh texts as Din Eidyn and in medieval Scottish records as Dunedene (Gaelic Dùn Èideann), all meaning "fort of Eidyn". Falkirk similarly has several alternative medieval forms meaning "speckled church": Eglesbreth etc. from Cumbric (Welsh eglwys fraith); Eiglesbrec etc. from Gaelic (modern Gaelic eaglais bhreac); Faukirk etc. from Scots (Old English fāg cirice). Kirkintilloch began as a Cumbric name recorded as Caerpentaloch in the 10th century, but was partly replaced by the Gaelic words ceann "head" + tulach "hillock" later on. Kinneil derives from Gaelic ceann fhàil "head of the [Antonine] Wall" but it was recorded by Nennius as Penguaul (Welsh pen gwawl) and by Bede as Peanfahel, which appears to be a merger of British and Gaelic. Counting systems of possible Cumbric origin, modern Welsh included for comparison. Among the evidence that Cumbric served as a substratum that influenced local English dialects are a group of counting systems, or scores, recorded in various parts of northern England. Around 100 of these systems have been collected since the 18th century; the scholarly consensus is that these derive from a Brittonic language closely related to Welsh. Though they are often referred to as "sheep-counting numerals", most recorded scores were not used to count sheep, but in knitting or for children's games or nursery rhymes. These scores are often suggested to represent a survival from medieval Cumbric, a theory first popularized in the 19th century. However, later scholars came to reject this idea, suggesting instead that the scores were later imports from either Wales or Scotland, but in light of the dearth of evidence for any of these theories, Markku Filppula, Juhani Klemola, and Heli Paulasto note that it remains plausible that the counting systems are indeed of Cumbric origin. Brat – apron. The word is found in Welsh ("rag, cloth; pinafore"), Scots and northern English dialects but may be an Old English borrowing from Old Irish. Crag – rocks. Either from Brittonic (Welsh craig) or Goidelic (Scottish Gaelic creag). The linguistic term Cumbric is defined according to geographical rather than linguistic criteria: that is, it refers to the variety of Brittonic spoken within a particular region of North Britain and implies nothing about that variety except that it was geographically distinct from other varieties. This has led to a discussion about the nature of Cumbric and its relationship with other Brittonic languages, in particular with Old Welsh. Linguists appear undecided as to whether Cumbric should be considered a separate language, or a dialect of Old Welsh. Koch calls it a dialect but goes on to say that some of the place names in the Cumbric region "clearly reflect a developed medieval language, much like Welsh, Cornish or Breton". Jackson also calls it a dialect but points out that "to call it Pr[imitive] W[elsh] would be inaccurate", so clearly views it as distinct in some meaningful respect. It has been suggested that Cumbric was more closely aligned to the Pictish language than to Welsh, though there is considerable debate regarding the classification of that language. On the basis of place name evidence it has also been proposed that all three languages were very similar. The whole question is made more complex because there is no consensus as to whether any principled distinction can be made between languages and dialects. Below, some of the proposed differences between Cumbric and Old Welsh are discussed. In Welsh, Cornish, and Breton, the Common Brittonic cluster *rk was spirantized to /rx/ (Welsh rch, Cornish rgh, Breton rc'h) but a number of place names appear to show Cumbric retained the stop in this position. Lanark and Lanercost are thought to contain the equivalent of Welsh llannerch 'clearing'. There is evidence to the contrary, however, including the place names Powmaughan and Maughanby (containing Welsh Meirchion) and the word kelchyn (related to Welsh cylch). Jackson concludes that the change of Common Brittonic *rk > /rx/ "may have been somewhat later in Cumbric". Old English Cumbraland "land of Cumbrians" (from Common Brittonic *kombrogi, whence Welsh Cymru "Wales" also originates). Crombocwater and Crombokwatre, two 14th-century records of Crummock Water and Crombok an 1189 record for Crummack Dale in Yorkshire (from Common Brittonic *Crumbāco- "curved one" (W crwm "curved")). Cam Beck, the name of a stream in north Cumbria recorded as Camboc (1169) and believed to be from Common Brittonic *Cambāco- "crooked stream" (W cam, CB kamm). Crimple Beck, Yorkshire, which is said to derive from Common Brittonic. *Crumbopull- "crooked pool". Here the b is assumed to have survived late enough to cause provection. Jackson notes that only in the north does the cluster appear in place names borrowed after circa 600AD and concludes that it may have been a later dialectal survival here. Jackson notes the legal term galnys, equivalent to Welsh galanas, may show syncope of internal syllables to be a feature of Cumbric. Further evidence is wanting, however. James mentions that devoicing appears to be a feature of many Cumbric place names. Devoicing of word final consonants is a feature of modern Breton and, to an extent, Cornish. Watson notes initial devoicing in Tinnis Castle (in Drumelzier) (compare Welsh dinas 'fortress, city') as an example of this, which can also be seen in the Cornish Tintagel, din 'fort'. Also notable are the different English names of two Welsh towns named Dinbych ('little fort'); Denbigh and Tenby. There is also a significant number of place names which do not support this theory. Devoke Water and Cumdivock (< Dyfoc, according to Ekwall) and Derwent (< Common Brittonic Derwentiō) all have initial /d/. The name Calder (< Brit. *Caletodubro-) in fact appears to show a voiced Cumbric consonant where Welsh has Calettwr by provection, which Jackson believes reflects an earlier stage of pronunciation. Jackson also notes that Old English had no internal or final /g/, so would be borrowed with /k/ by sound substitution. This can be seen in names with c, k, ck (e.g. Cocker < Brittonic *kukro-,[clarification needed] Eccles < Brittonic eglēsia). The Cumbric personal names Gospatrick, Gososwald and Gosmungo meaning 'servant of St...' (Welsh, Cornish, Breton gwas 'servant, boy') and the Galloway dialect word gossock 'short, dark haired inhabitant of Wigtownshire' (W. gwasog 'a servant') apparently show that the Cumbric equivalent of Welsh and Cornish gwas & B gwaz 'servant' was *gos. Jackson suggests that it may be a survival of the original Proto-Celtic form of the word in –o- (i.e. *uɸo-sto). This idea is disputed by the Dictionary of the Scots Language; and the occurrence in Gospatrick's Writ of the word wassenas 'dependants', thought to be from the same word gwas, is evidence against Jackson's theory. Koch notes that the alternation between gwa- and go- is common among the Brittonic languages and does not amount to a systematic sound change in any of them. The form derwennydd however, is at odds with the absence of the ending -ydd noted below. Treales, Lancashire (Treueles 1086): possibly 'village of the court' (Welsh tre(f) y llys). But note Treflys, Powys which has no article. Pen-y-Ghent, Yorkshire (Penegent 1307): 'hill of the border country' (Welsh pen y gaint). The final element is disputed. Ekwall says it is identical to Kent (< Br *Kantion), which is related to Welsh cant 'rim, border', though Mills gives 'coastal district' or 'land of the hosts or armies' for the county. Traquair, Borders (Treverquyrd 1124): 'homestead on the River Quair' (Welsh tre(f) y Quair). Liscard, Wirral Peninsula (Lisenecark 1260): possibly 'court of the rock' (Welsh llys y garreg), but also suggested is Irish lios na carraige of identical meaning. Although Koch cites this as an example of Cumbric, it lies outside his own definition of the Cumbric region. Of all the names of possible Cumbric derivation, few are more certain than Carlisle and Derwent which can be directly traced back to their Romano-British recorded forms Luguvalium and Derventio. The modern and medieval forms of Carlisle (Luel c1050, Cardeol 1092, Karlioli c1100 (in the Medieval Latin genitive case), Cærleoil 1130) and Derwent (Deorwentan stream c890 (Old English), Derewent) suggest derivations from Br *Luguvaljon and *Derwentjō. But the Welsh forms Caerliwelydd and Derwennydd are derived from alternative forms *Luguvalijon, *Derwentijō which gave the -ydd ending. This appears to show a divergence between Cumbric and Welsh at a relatively early date. If this was an early dialectal variation, it can't be applied as a universal sound law, as the equivalent of W mynydd 'mountain' occurs in a number of Cumbric names with the spirant intact: E.g. Mindrum (Minethrum 1050) from 'mountain ridge' (Welsh mynydd trum). It might also be noted that Medieval Welsh forms of Caerliwelydd and Derwennydd both occur in poems of supposed Cumbrian origin whose rhyme and metre would be disrupted if the ending were absent. One particularly distinctive element of Cumbric is the repeated use of the element Gos- or Cos- (W. gwas 'boy, lad; servant, attendant') in personal names, followed by the name of a saint. The practice is reminiscent of Gaelic names such as Maol Choluim "Malcolm" and Gille Crìosd "Gilchrist", which have Scottish Gaelic maol (Old Irish máel 'bald, tonsured; servant') and gille (servant, lad', < Old Irish gilla 'a youth'). The most well-known example of this Cumbric naming practice is Gospatric, which occurs as the name of several notable Anglo-Scottish noblemen in the 11th and 12th centuries. Other examples, standardised from original sources, include Gosmungo (Saint Mungo), Gososwald (Oswald of Northumbria) and Goscuthbert (Cuthbert). It is impossible to give an exact date of the extinction of Cumbric. However, there are some pointers which may give a reasonably accurate estimate. In the mid-11th century, some landowners still bore what appear to be Cumbric names. Examples of such landowners are Dunegal (Dyfnwal), lord of Strathnith or Nithsdale; Moryn (Morien), lord of Cardew and Cumdivock near Carlisle; and Eilifr (Eliffer), lord of Penrith. There is a village near Carlisle called Cumwhitton (earlier Cumquinton). This appears to contain the Norman name Quinton. There were no Normans in this area until 1069 at the earliest. In the Battle of the Standard in 1138, the Cumbrians are noted as a separate ethnic group. Given that their material culture was very similar to their Gaelic and Anglian neighbours, it is arguable that what set them apart was still their language. Also the castle at Castle Carrock – Castell Caerog – dates from around 1160–1170. Barmulloch, earlier Badermonoc (Cumbric "monk's dwelling"), was given to the church by Malcolm IV of Scotland between 1153 and 1165. A more controversial point is the surname Wallace. It means "Welshman". It is possible that all the Wallaces in the Clyde area were medieval immigrants from Wales, but given that the term was also used for local Cumbric speaking Strathclyde Welsh it seems equally if not more likely that the surname refers to people who were seen as being "Welsh" due to their Cumbric language. Surnames in Scotland were not inherited before 1200 and not regularly until 1400. William Wallace (known in Gaelic as Uilleam Breatnach – namely William the Briton or Welshman) came from the Renfrew area – itself a Cumbric name. Wallace slew the sheriff of Lanark (also a Cumbric name) in 1297. Even if he had inherited the surname from his father, it is possible that the family spoke Cumbric within memory in order to be thus named. There are also some historical pointers to a continuing separate ethnic identity. Prior to being crowned king of Scotland in 1124, David I was invested with the title Prince of the Cumbrians. William the Lion between 1173–1180 made an address to his subjects, identifying the Cumbrians as a separate group. This does not prove that any of them still spoke Cumbric at this time. The legal documents in the Lanercost Cartulary, dating from the late 12th century, show witnesses with Norman French or English names, and no obvious Cumbric names. Though these people represent the upper classes, it seems significant that by the late 12th century in the Lanercost area, Cumbric is not obvious in these personal names. In 1262 in Peebles, jurymen in a legal dispute over peat cutting also have names which mostly appear Norman French or English, but possible exceptions are Gauri Pluchan, Cokin Smith and Robert Gladhoc, where Gladhoc has the look of an adjective similar to Welsh "gwladog" = "countryman". In the charters of Wetherall Priory near Carlisle there is a monk called Robert Minnoc who appears as a witness to 8 charters dating from around 1260. His name is variously spelled Minnoc/Minot/Mynoc and it is tempting to see an equivalent of the Welsh "mynach" – "Robert the Monk" here. Given that the Anglicisation of the upper classes in general has happened before the Anglicisation of the peasantry in other areas which have given up speaking Celtic languages it is not implausible that the peasantry continued to speak Cumbric for at least a little while after. Around 1200 there is a list of the names of men living in the area of Peebles. Amongst them are Cumbric names such as Gospatrick: servant or follower of Saint Patrick, Gosmungo: servant of Saint Mungo, Guososwald: servant of Oswald of Northumbria and Goscubrycht: servant of Cuthbert. Two of the saints – Oswald and Cuthbert — are from Northumbria showing influence on Cumbric not found in Welsh. The royal seal of Alexander III of Scotland (who reigned 4 September 1241 – 19 March 1286) bore the title "Rex Scotorum et Britanniarum", or "King of Scots and Britons". In 1305 Edward I of England prohibited the Leges inter Brettos et Scottos. The term Brets or Britons refers to the native, traditionally Cumbric speaking people of southern Scotland. It seems that Cumbric could well have survived into the middle of the 12th century as a community language and even lasted into the 13th on the tongues of the last remaining speakers. Certain areas seem to be particularly dense in Cumbric place-names even down to very minor features. The two most striking of these are around Lanercost east of Carlisle and around Torquhan south of Edinburgh. If the 1262 names from Peebles do contain traces of Cumbric personal names then we can imagine Cumbric dying out between 1250 and 1300 at the very latest. In the 2000s, a group of enthusiasts proposed a revival of the Cumbric language and launched a social networking site and a "revived Cumbric" guidebook to promote it, but with little success. Writing in Carn magazine, Colin Lewis noted that there was disagreement in the group about whether to base "revived Cumbric" on the surviving sources for the language or try to reconstruct the form Late Cumbric may have taken after the attested period, but his own suggestion was simply to use Modern Welsh, with its rich literature, culture and history. ^ a b c d e f Koch, John T. (2006). Celtic Culture: a historical encyclopedia. ABC-CLIO. pp. 515–516. ^ a b Broun, Dauvit (2004): 'The Welsh identity of the kingdom of Strathclyde, ca 900-ca 1200', Innes Review 55, pp 111–80. ^ a b c d Armstrong, A. M., Mawer, A., Stenton, F. M. and Dickens, B. (1952) The Place-Names of Cumberland. Cambridge: Cambridge University Press. ^ Kenneth H. Jackson, Language and history in early Britain, Edinburgh University press, 1953, p. 10. ^ Davies (2005), p. 232. ^ Jackson (1953), pp 3–11; 690. ^ Elliott (2005), p. 583. ^ Jackson (1969), pp. 86, 90. ^ Black, William George (1883). Transactions of the Glasgow Archaeological Society (Volume 2 ed.). Glasgow: J. Maclehose & sons. pp. 219–228. ^ a b c Filppula, Klemola, and Paulasto, pp. 102–105. ^ "Dictionary of the Scots Language". Retrieved 13 March 2011. ^ Rollinson, William (1997). The Cumbrian Dictionary. Otley, UK: Smith Settle. ISBN 1-85825-067-6. ^ MacBain, Alexander (1911). An Etymological Dictionary of the Gaelic Language. ^ "Dictionary of the Scots Language". ^ Taylor, Simon. "The Glasgow Story – Early Times to 1560". Taylor, Simon. "The Glasgow Story: Beginnings: Early Times to 1560". The Glasgow Story. Retrieved 2 August 2012. ^ Meg Jorsh (16 June 2009). "New website launched for people who want to talk in Cumbric". News and Star. Archived from the original on 22 March 2012. Retrieved 8 December 2010. ^ "Cumbraek: A modern reinvention of the lost Celtic language of Cumbric". Cumbraek. Retrieved 25 June 2017. ^ Lewis, Colin (2009). "Cumbrian Welsh – an update" (PDF). Carn. 144: 10. Retrieved 8 December 2010. Davies, Wendy (2005). "The Celtic Kingdoms". In Fouracre, Paul; McKitterick, Rosamond (eds.). The New Cambridge Medieval History: c. 500–c. 700. Cambridge: Cambridge University Press. ISBN 0-521-36291-1. Elliott, Elizabeth (2005). "Scottish Writing". In Fouracre, Paul; McKitterick, Rosamond (eds.). The New Cambridge Medieval History: c. 500–c. 700. Cambridge: Cambridge University Press. ISBN 0-521-36291-1. Filppula, Markku; Juhani Klemola; Heli Paulasto (2008). English and Celtic in Contact. Psychology Press. ISBN 0-415-26602-5. Retrieved 2 December 2010. This page was last edited on 10 February 2019, at 16:25 (UTC).